Walking the Las Vegas Strip may be one of the best ways to see and explore this amazing city, full of visual attractions and surprises. When Walking the the strip you can take the elevators to top levels and cross all the bridges traversing the wide busy boulevard. Looking up and down the strip from this vantage point is a great way to grasp the whole length of it, and a wonderful time to take some incredible pictures of buildings, lights and reflections. The strip is a little over four miles, and the buildings are much further apart than they seem to be on paper. Trust me, there’s so much to see and do that the distance won’t be an issue. As you walk along the streets and take in all that surrounds you, you start to realize that this simply can’t be done in one visit. If you want to get the best of the strip, I would advise to combine the walking with the bus riding. – In fact, if you are new to the Las Vegas strip, as we were the first time, a bus ride would be the best for the first day. Take the bus in both directions so you can locate what and where are the most important attractions and get a little familiar with the place. – Get a day ticket on the Deuce — the double deck bus, and go to the top level. You will see everything in perspective and have a good understanding of what it’s all about. Another good thing about combining your walking the Las Vegas strip with bus riding is that you can get in and on and off any time. You can walk, visit, have lunch or dinner and get back to the bus with no extra cost. *ExtraTip: For the Deuce you cannot buy the ticket on the bus, so check the Ticket Vending Machines on the strip. The air in Las Vegas is very dry and you lose water without noticing it. This can make you more tired faster. You can carry some water in your backpack or you can just buy it in any store – keep in mind though that everything on the strip is more expensive. – From about June (sometime earlier) to October, Las Vegas gets very hot. You should limit your walking the Las Vegas Strip, and stay more inside – every place is air conditioned. Enter as much as possible in stores – they are always cool in both senses ;) Believe me, there is so much to see inside! Combining your walking with a ride on the Las Vegas monorail, is a way to keep you cool as well. 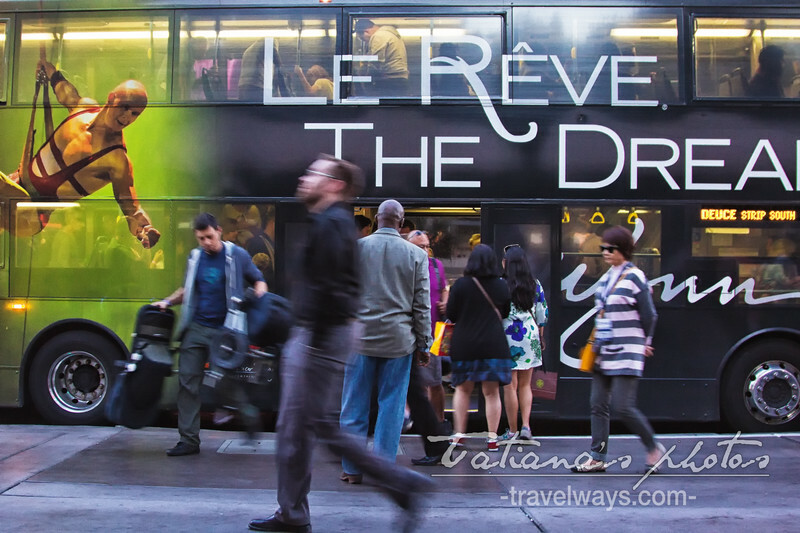 – There are also free shuttles and free trams from and to major destinations on the strip. 5. Walking the Las Vegas strip at night is totally safe. – the fine for Jaywalking in Las Vegas is $198.00! A map would be very useful too when walking on Las Vegas Strip. You can ask your hotel where to get one, or buy your Las Vegas Map before you start the trip.